It’s time for another group posting of the Insecure Writer’s Support Group! Time to release our fears to the world – or offer encouragement to those who are feeling neurotic. If you’d like to join us, click on the tab above and sign up. We post the first Wednesday of every month. I encourage everyone to visit at least a dozen new blogs and leave a comment. Your words might be the encouragement someone needs. My awesome co-hosts today are Kristin Smith, Elsie, Suzanne Furness, and Fundy Blue! 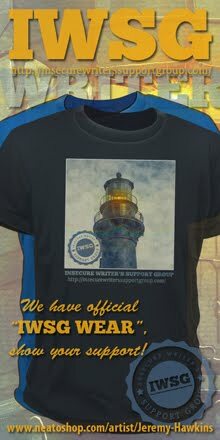 Today marks the one year anniversary since the IWSG site and Facebook group opened. 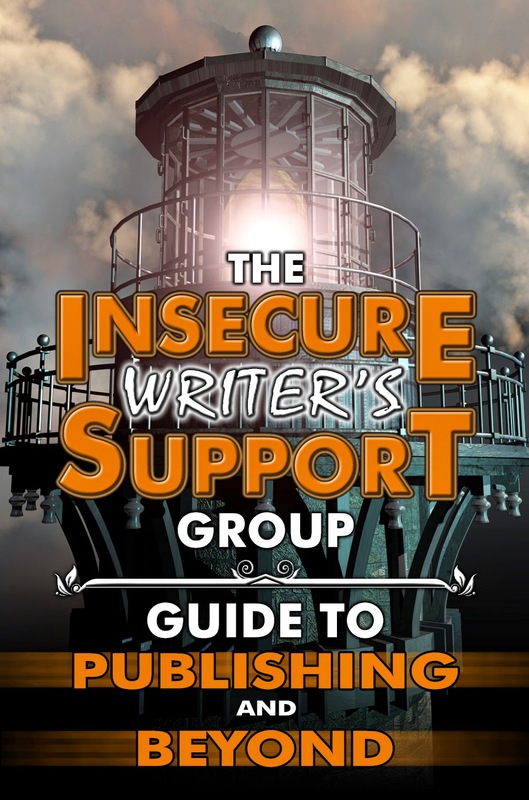 We invite all IWSG members, Facebook members, and followers to contribute to The IWSG Guide to Publishing and Beyond, whether you are a writer on the journey or a published author. Post your contribution today or email your submission to the IWSG or me. Full details posted today at the IWSG site. If you are posting for the anthology today be sure to include: title, topic (writing, publishing, or marketing), a one line bio (with your name, book(s), and blog), and state that you give us permission to use it. After you have posted, please add your link HERE. As I mentioned earlier this week, I completed revisions on my latest manuscript and sent it to my publisher last Friday. Yeah, baby – done! While there are things I can’t share yet about the story (at least until I hear back from my publisher) I can give you a few hints. It’s a stand-alone space opera story. Set in a world different than the Cassa series. There’s more than one woman in this book! I aimed for grittier. I missed. You would think since I’ve been reading Joe Abercrombie lately some of that would’ve rubbed off. This story has been with me for ten years, ever since I first heard the song that inspired it. Don’t forget October 20 is the Survive and Thrive Bloghop. It’s all about prevention and staying healthy, so please join us. There's also a great giveaway - visit Sydney's site for details. Jessica will be visiting the Ninja Army on October 13! Spread the news! If you have a high school student, encourage them to enter. Authors sign up for a blog hop, write a post about the books they are handing out and post it on Halloween, people visit their blogs and comment trick-or-treat and the author gives them an ebook. EBOOKS ARE THE CANDY! Picking up a solid gold Godzilla? Know a high school student who’d like to enter the writing contest? Anyone else base a story off of a song? What are your writer insecurities today? And are you contributing to the IWSG book…? Hi Alex - Congratulations on setting up the IWSG and the site .. and now the Guide to be - which everyone is enjoying writing for .. it will be very useful. Congratulations on those completed revisions! And I've finally joined the Facebook group. Took me long enough! :) You've created something wonderful here Alex. Girls, and aiming for grittier? Hmm. I always start my stories at the end and develop towards it. Congrats on getting finished. I didn't post a submission for the anthology, too insecure at this time in my life. I'm sure you will get lots of excellent submissions though. Congratulations. I really don't know how you have time to achieve all that you do. I suspect even the clones have a hard time keeping up. Normally let the song's inspire in the background. But yesterday I began creating a short story around 'Get Your Kicks on Route 66'. And that links to my IWSG post - a mnemonic for the anthology. Congratulations to all concerned with a great resource. Congrats on the next book. And I'm curious about the song. Very curious. Looking forward to the writing guide. I have a feeling I'll learn a ton from everyone. Congrats on the anniversary of the ISWG website. Gosh Halloween around the corner, must dust my broomstick. I don't have an ebook player so will have to give that a miss. Great job on finishing your revisions! Congrats on the IWSG anniversary - the book was a fantastic idea! Do you really think this will be your last book? If that is so, what are you going to do with your spare time? Your new book sounds awesome. Sorry you're not going to write anymore. I'm actually contemplating just writing for myself. Like you, I have lots of other interests. How big is that Godzilla? When will you tell us which song you wrote about? Congrats again on finishing another book. Congrats on finishing your revisions and also Happy anniversary! But no more writing? No, I think the momentum would work itself for you to produce more.Great write Alex! Congrats on finishing another novel *throws confetti* Many times I've heard a song that's inspired a story in my head, so I think it's so cool you actually took it and ran with it! And I'll let my high schooler know about that contest :-) My entry for the anthology is up! Your new book sounds promising! And why don't intend to write more books? Everyone's going to be asking you the same question: Why do you feel the need to quit writing? Perhaps after a long break you'll get the itch that won't quit...Congrats on finishing you book!! A bunch of coolness happening here today! That blog looks interesting! Hope you day is filled with inspiring comments!! Woot! Congrats on finishing up revisions!!! You are a ninja. Thanks, Alex, for all that you do. Congrats on completing your revisions. Congratulations also to those with new releases. Your new book sounds intriguing--can't wait to hear ALL the details. I'm sure you know what's best for you, but it did seem sad to me that you don't intend on writing any more books. Who knows--maybe another idea will strike your brain someday. Don't rule it out completely. Hopefully I get my submission for the anthology done today. What a great way to be inspired to write - through a song. Very cool. I can't wait to see how you weaved the (almost) lyrics into it. Thanks for doing the book to help others, it's gonna rock! Your book sounds intriguing--I love how you've incorporated something so important to you--your music. DO you really think this will be your last one? I am prepared to take a bet with you Alex that having now written 4 books you won't stop there. Looking forward to reading this one. Oh I will definitely buy a gold godzilla!! No doubt somebody will. Bit of a waste of money though. You're the first person I know who wrote a story based on a song. That's actually pretty neat. It seems like a few others resonated my same insecurities even though I didn't actually call it by name ~ distractions. I seem to stay in this state of mind and can't find my way around it. There is a time and season for all things. I just need to be patient with myself to get beyond this point and I will. Thanks for the encouragement! A 24 karat Godzilla? I think I could find loads of other ways to use that gold. Congratulations for all the success of the IWSG website and bloghop, I'm sure the anthology is going to be awesome. And I'm excited to hear more about your new book! I'm interested in knowing about the song that inspired you.... very cool. And funny you should mention Godzilla on your blog today, I mentioned him in my comment over at Pat's bay... Oh and I'd buy the 24-karat gold Godzilla, but only if it could fire out atomic breath. Congratulations on your book's completion. I think the eBook is a great idea. Congrats on sending off your next novel, and I doubt you're done writing. You're the reluctant writer, and a successful one at that! Thanks for all you do for the writing community, especially IWSG! Congrats on finishing your book! All my books these days are set in first person...so I guess I like being in my characters' heads! It sounds like a great story. Congrats on the amazing success of the IWSG, too! Alex, congrats of the site... I so want a gold Godzilla. Great stuff as always, hey you out there in the cold... did you read there is a new PINK FLOYD album coming out soon? I just wanted to let you know I start part-time gig today and my freelance is on the rise, so a lot of ghost posting the next few months... Happy Oct 1, 2014. This Message has been ADD approved, hopefully my schedule won't be to Willy Wonka... Have a great day. Hmm, I'm going to take a wild guess and think Rush as the band who inspired your standalone? That would be cool . . . but I know anything you do will be awesome. Dolorah, that's how I write - the ending first. Sittie, awesome! I'll get there eventually. Natalie, that's the problem - too much else to do. Zoltan, I never intended on writing more than one. Just so involved with my music right now. Melanie, it is at the moment. Elise, now atomic breath would be cool. Donna, no triangle! Just more than one female character. Didn't know your latest was inspired by a song. I often get ideas like that too, wanting to expand the story with full-blown characters. Very cool, and congratulations! Say what? Your last book? You mean your very very very last book or just not another series? Nosey, aren't I? You've teased us enough about the story and now adding it is based on a song makes me more curious. Very clever. Yes, I'm IN for the writing tips guide. As I hop about the blogosphere, it looks like you will have an informative guide for writers. Thanks so much for the opportunity to help writers. I love that your new book was inspired by a song! The Trick-or-Treat bloghop sounds like a great idea! And I think Jess might be interested in the Bold New Worlds contest. Thanks for sharing! Alex - the reluctant heroic writer . . . :) Love the tidbits about your story. I've written a few stories here and there inspired by something from a song. Nothing wrong with mixing a little fantasy with your science fiction. Just ask the writers on the Thor movies. And as far as basing a story off a song, I haven't tried that, although now "Godzilla" from Blue Oyster Cult is running over and over in my head. Thanks, Alex. Happy Anniversary to the group! That song thing has me super curious now. (as if I weren't already!) I'll have to tell my daughter about the contest. See what she says. That godzilla is awesome - a total waste of money but awesome. Ha, the last one you'll write...w heard that before, dear Alex. Never say never, they say...only kidding. I'm feeling the same way right now. Congrats on getting it to your publisher. Awesome accomplishment. A big congrats to you and your team at IWSG. I am sure there will be more than one anniversary being celebrated! I am looking forward to reading the anthology when it comes out and hey, your new work sounds very interesting. I picked up on the "more than one girl, in this one" lol. I remember when you got harassed for not having any feminine characters in your stories. Okay, no hint on the song? Is it even from a well known artist? And you're going to quit writing!? Really? Can you really write a stand-alone book?! I don't think I could. My mind is always twenty steps ahead, so there's always more stories. And I never want my characters to end. I almost rented Godzilla last night but #TFIOS won. Hahaha! But I will soon. Jeremy, I did know about the Floyd album. And great news about the gig!! Thanks, Bob. Not Rush, but it is another prog rock band. Madeline, I've learned never to say never. But I keep trying anyway. Ken, maybe that's a hint? Carolyn, proves I can learn, right? Tamara, can't hint - it would give away the title and the storyline. Pop the bubbly - congrats on finishing your story. Very cool concept to make it fit every line of that song, in a different order. Looking forward to the new book and song release so we can try and figure it out! 10 years... a decade of birthing...wow. Submitting to the IWSG anthology...thanks for the opportunity to create and participate. Your new book sounds very interesting. Glad you didn't go as dark as Joe Abercrombie. And if I had 1.5 million I don't think that is how I would invest it. I'm not contributing to the anthology only because at this point, I feel like I know nothing and have no wisdom to impart to others. I'll probably get over it soon. Maybe. Hopefully. Also, I had to laugh at that line about this being the last book you intend to write. Yup, I've heard that one from you before. ;) Do you really think your fans are going to let you get away with quitting? I think not, haha. Now I'm going to spend all day wondering was the song was. Or thinking of songs and wondering if there's a story in there (other than the intended one). Congratulations on finishing the new book. Can't wait to get the final anthology, it will be great! So looking forward to reading this new novel, and love the tidbits you handed out today. (Not keen on the idea of it being your last one) Yes, I've sent in my contribution to the guide, but forgot to send in my bio info, but I think you know all that anyway. Don't fancy the solid gold Godzilla, but wow, it's amazing to think there are folks out there with money to burn on something like that! I've had songs influence a lot of my work, "The Last Words You Said" sung by Sarah Brightman gave me the missing piece in my novel "Evangeline's Miracle" and the list goes on... Happy Anniversary!! I wonder how heavy that golden Godzilla is. The new novel sounds great, Alex! I'm looking forward to hearing more about it. Interesting use a song as a source of inpiración for a book! Okay, can't wait to hear the song title! Every time I hear Hotel California, I think I'd love to write a story inspired by that song. I'm sure other people have. Congrats of finishing the book. You're on top of things. Can't wait to hear more about it. One year already? I can't believe it. It's gone by so fast. I really want to know what song you used as inspiration. That's so cool. I wish I could afford that solid gold godzilla. Alas, I cannot. Jennifer, I hope I can! Ilima, I can hope, right? Lisa, don't worry, we'll figure it all out and get a bio in there for you. And everyone, forgive me! I am working my way through my blogger buddies and IWSG list, so I'll be a little slow getting back to everyone. You should see my email right now... I'll get to those as well! I don't write to music so I usually listen before I write--I've definitely let songs inspire my stories! Congratulations on finishing your revisions, Alex. Can't imagine there were very many. Hope this book hits the best sellers list and higher. Ooh, your new story sounds good. I can't wait to find out more about it. Yay for IWSG! I'm reading some awesome posts this morning. Imagine how heavy that Godzilla must be! Congrats again on finishing your new work. LUCKY YOU is right! Nothing new hear, just playing catchup and keeping my head above water. CONGRATS on the one year anniversary on Facebook! SO much has stemmed from your original idea. It is a whirlwind for sure! Looking forward to reading the 'GUIDE!" I know I will learn so much from all our talented blogger family! haha yeah if I had a spare 1.5 million, wouldn't spend it on a statue, gold or not. That must feel great to get the story out of your head and done after 10 years. Congrats on the IWSG anniversary, so pleased to be co-hosting this month. The insight into your new novel is intriguing. Love the idea of the inspiration coming from a song, can't wait to hear more about it soon. I wrote my very first story based off a song. I must have played it 5,000 times as I worked. I hate to hear this is the last story you intend to write, but I can't wait to read it! Happy one year to IWSG website! Congrats on sending your book off to your publisher. I love that it was inspired by a song. It's inspiring that it took you ten years to write it. But no more writing? I hope not! Hi Alex, please let this not be your last book. You definitely have more stories lurking inside your head. Congrats on the first anniversary of the IWSG. I sent my contribution to the IWSG e-mail yesterday, though I didn't realize we had to include a title with it! The last book I was released was inspired by the story behind a song, and loosely based around the lyrics of the song. Woohoo! A standalone? That's awesome. I'm looking forward to it. I think stories that have been with us for years turn into the best ones. Joylene, my critique partners found enough mistakes though! Birgit, that made me laugh! And if my publisher accepts the manuscript, I will reveal the song. Christine, he could do some damage. Gwen, someone has to roll like that. 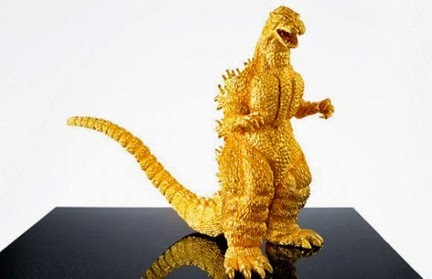 A 24-karat solid gold Godzilla? Now where to put it? LOL. Might make for an interesting bookend if there were two of them. October 20th is going to be a busy day for bloghops. The Survive And Thrive Bloghop sounds like it will be a good one. Congratulations on getting your book done! While I've never written a story based off of a song, I do write songs. Often, there's a whole back story to the song that I never tell anyone. Hmm... You've got me thinking now! Oh - I met a highly prolific author on Twitter, Terry Tyler, who has written a slew of novels, each of which uses an Aerosmith song as its title! I figured my stuff was too long for what y'all are looking for for the book but, if I've posted anything you want to use, let me know. I love how you think you'll have any say about whether you'll write another book or not. Congrats on the IWSG anniversary and amazing idea about the anthology! Thank you for all your support and encouragement for the entire blogging community. I wonder how heavy that Godzilla is? Congrats on getting your revisions done! That's always a great feeling. I've never thought of writing a book based on a song. Can't wait to see what it is. Thanks so much for hosting IWSG day and good luck with whatever your next project is! I'm going to pass the contest on to a teacher at a high school I recently visited. I think she'd be interested in having some of her students enter the contest. I've never written to a song, but two people have given my MC in Double Negative a song of his own. Interesting. Just posted my link for the contribution to the Guide. I'm so excited about your new IWSG Guide! I've already learned a few marketing tips that I can't wait to use! Your manuscript sounds wonderful, and I look forward to hearing more about it. Thanks for everything, Alex! Your story hints are very intriguing and I think it's so cool that it was inspired by a song. And that you've had it in your head for so many years! No doubt this will be another big hit. Congratulations, Alex, on the first anniversary of your brain child IWSG! Also, best of success with your latest publication in progress. Your blog site always offers up to date info for writers Thanks for the heads-up on the October/Halloween blog hop. Congrats on the new book! I sort of based the Backworlds on a line of a song by Concrete Blonde. One line went: the war was over and the good guys lost. I wrote on the three topics, but not for the anthology. I didn't have that sort of inspiration. You say that now, but I bet another book will surface, wanting to be written!! More women! Congrats on completing it. I'd take that Godzilla in plastic even. Alex, the idea that you completed a manuscript whose inspiration has been with you for ten years is inspiring to me. I sometimes wonder about ghost projects. They're real in your head but really mean nothing until you can get them out and let someone else read them. Well, well done. You are going strong, my friend! Also, I'm--like everyone else, I'm sure--pretty curious about the song! As a matter of fact, I AM picking up that solid gold Godzilla. Seriously, though, glad to hear you're getting that ten year old story out into the light of day. That has to be all sorts of satisfying....if not confusing, as you mentioned. Hi Alex, Thanks so much for the shout out. I will be returning to IWSG next month, promise. I miss you guys!!! That story sounds awesome, can't wait to check it out. Now see that Godzilla would go well along side my green one from the 80's. Suzanne, I know - there are three that day! Tui, considering I'm a guitarist, I need to write more songs. Heather! I don't have a say? Crap. Gail, I try to keep up with everything. Mark, that made me laugh! Brandon, I have one of those! From the 60's though. And from Japan. How cool that your novel was inspired by a song. Thank you for all of your support, Alex! Thanks for the shoutout to my blog hop too. It's going to be fun! Christmas is coming, so I think I'll take a dozen of them there Godzilla fellas. Just kidding! Don't you say; 'this is my last book', almost every time you have one ready to go? Me thinks, I don't believe you anymore. Those creative juices just keep flowing. I'm pretty sure you said the song in your last BOTB was the inspiration for this story. If I'm correct then I'm really intrigued now. Darn, if only it was 1 mil or less I could consider a solid gold Godzilla. Okay, not really, but that's okay. I'm not sure where I'd put it. Congrats on finishing the book. I hope your publisher loves it. Congrats on one year. IWSG has touched so many, including me, and I can't wait to read the anthology. Best wishes for many more years to come! James Bond already said it. Never say Never again. Probably in 10 years you'll be writing about a song you heard today. The irony, you keep saying you're not writing anymore but it just keeps coming to you. I thought I would write forever and it's just not happening. Oh! And thank you so very much for giving me an idea of how to invest my fortune. Dwarves are very excited about acquiring that Godzilla. We'll use it to prop the door open when it's hot... Wait. Tassin says we're not gonna buy it. Now what are those black suits and masks for? Hmmmm. Okay, sounds terrific; but can I listen to the song? Please? Congrats on sending it off to your publisher. Must be great to finally have it out after ten years. Woo-hoo! Congrats on getting those revisions done! Brian, once I sign the contract I'll reveal the song. Faraway, crap! And the last song was an inspiration for my first book, CassaStar. Feather, when and if I sign a contract! Congrats on the book being almost finished!! I completely adore the idea of basing your story on a song, and including the lyrics. Such a cool thing to do! I think I'll have to pass on the gold Godzilla. -I've never based a story off a song before, but I've written some poetry inspired by Otis Redding. -I can't wait to learn more about your book.I'm already intrigued...Did you say it would be you last one? You do such amazing things for us Alex. I will forever be in awe. Now I'm going to HAVE to grab that book because I'm going to need to figure out how you turned that song around and made it into your own novel. Impressive. You know I have to love the idea of a book inspired by song lyrics! Appreciate the opportunity to be part of the IWSG book. Congrats on the revisions being finished and your book being off to your publisher. Loved the hints. Some of the coolest books started out as something else. Go where inspiration and revisions take you. Got my IWSG post up this evening so better late than never...ish. God I need to get a computer, this one is so sluggish and freezes every minute for fifteen minutes. You shared some interesting books and good hops. Ebooks as candy? I'm there! Ha! If I could afford the gold godzilla I would have a brand new laptop now wouldn't I. Okay now I'm just whining. I'm watching the premiere of Stalker on CBS tonight. It stars Maggie Q. from CW's Nikita and the Divergent movie Franchise (she's Tori). See ya Alex. Congrats on finishing your manuscript! And ten years is a long time to hold an idea in your head, I'm right there with you on that. >_< But I'm glad you got the idea out and made a good tale out of it. Jeff, your contribution was great. Sheena-kay, really hope you get that computer. Guys, I will visit everyone I didn't get to tomorrow! Have hit brain freeze. Yay, Alex. Congrats on getting through those revisions. What a bundle of teasing hints, Alex! And well done on finishing those revisions. That is my least favorite part of the process, you're lucky that you enjoy revising. songs have a story to tell. I've heard songs that later played out in my dreams. Does that count? Congrats on finishing! Even though it sounds like it was tricky to craft based on what you were trying to do, it sounds like it mattered enough to hang around in your mind for ten years. Last book? Yeah,right. The whole book set to a song idea is intriguing. And with 10 years of planning, it should be great! What a great idea this anthology was! I read so many awesome posts today that were inspiring or full of great advice. I'm so excited for this anthology to come out, not only for myself, but for others I know who will benefit by all this awesomeness. Thanks for the opportunity to co-host—it has been a pleasure! Happy Anniversary, Alex! Thank you for masterminding this amazing thing and helping to gather this fantastic community!! An entire novel based on one song? I am so impressed! I've come up with short stories based on a song but my imagination never came up with an entire world and characters and a plot simply from listening to a tune- I don't know what could demonstrate the power of your imagination better than that! CONGRATS on finishing yet another stellar story I imagine! Oh, darling Alex, you INTEND for this book to be your last one. But if you are a natural storyteller (and clearly you are), other stories may appear in your head (like, say, because of a song's lyrics) and won't leave you alone until you write them down. On the other hand, I can see your novel writing taking a backseat in your future and your other gifts taking center stage. That's very cool that a song inspired you. I listen to music while I write, which inspires me, but not in the planning phase. One of my future releases was from an idea that I had 8 years ago, so some ideas just grab us and we have to go with them. Ian, I do enjoy it. Trudessa, thanks, and that counts! Angela, your piece was great! Sher, more like ten years of stewing. Kristin, thanks for being a co-host! I couldn't do it without you guys. It is exhausting. Beverly, I'm just hoping my imagination did enough. Helena, your vision might be true. I've never based a story on a song or lyrics but I did base one loosely on a poem called The Highwayman. I think that's awesome your story is based on a song. I've never done a full story on just one song, but I usually have multiple songs tied to parts of my stories. Yes, Hope for Her promises thrills! Congrats on a year and on turning in your ms. I always thought it would be cool to write a story simply based on song lyrics. I can't wait to read it! That is ingenious how you came up with your book idea. Can't wait to read it. What? At the end of your post you said, "And if I have my way, it’s the last one I intend to write…"
I hope this doesn't mean what I think it means. You are still going to write books, yes? "And if I have my way, it’s the last one I intend to write…" until that next idea starts niggling at the back of your mind...? It's shameful, but I'm SO jealous you finished your WIP and sent it off. I was at 25k at the beginning of the summer, and after multiple computer crashes and health issues and recent agent drama, I'm now at 35k. Waaaaaaa!!! "And if I have my way, it’s the last one I intend to write…"
WHAT?! Are you giving up writing? Congrats to Sydney and Jessica! Congratulations on finishing the manuscript, it sounds very interesting!! Loni, I hope I can reveal it soon. Michelle, an idea would actually have to hit. Lexa, you had things come up, so it's all right! And I never intended to write more than one book. My biggest writing insecurity is catching up on all those book reviews and finding enough time to enjoy blogging again. I just won't do it if it turns into a chore or "just one more thing to do" in list that's way too long already. The last one, huh? And then you will be focusing on your music? I need to go check out the high school contest. We're holding a teens only writing improv thing on the 11th, so I'll mention it if the deadline isn't before then. Congratulations on the progress with your book. That is amazing. Sometimes certain songs help me write certain scenes and i try to add the feeling of the song to the feeling of the scene. Like you said, it is hard. Thank you so much for your kind and encouraging words on my blog. It really helped. And I already emailed my entry to the anthology. Thank you so much for the opportunity to be apart of it. Congrats on your completed revision. *holding thumbs* for speedy positive feedback! I already emailed my contribution to the anthology to you as it's over 300 words. It's a marketing piece on easy, low cost video book trailers. I laughed out loud at the sentence, "If I have my way this is the last one..."
If you had your way, when you finished the Cassa Series you'd have been done. I'd like to add a solid gold Godzilla to my collection! Too bad I don't have 1.5 million dollars for it. I generally have songs that influence my books. One book has a song for each perspective character and those heavily influence their individual plots. Congrats on finishing the edits and I hope you get your wish. MJ, never do it if it's not fun. Shannon, that's the plan. And please pass along the contest. Murees, that's good to hear, and thanks for submitting to the book. HJ, and it was great!!!! Robin, I know, I know! Elizabeth, but it gave me a good chuckle. Hmmm... I think I'm going to pass on the solid gold Godzilla. Now maybe if it was diamonds that dazzle with rainbow colors in the light, then maybe. Congrats on finishing the revisions. That's very interesting how you were inspired and interspersed the lines of the song in the book. Can't wait to find out what the song is. Alex, thanks to you and your team for taking the time to oversee this book project. Thanks for the heads up on the Trick-Or-Treat Book Bloghop. Sounds fun! Woohoo! :D High five for finishing revisions! I can't wait to hear more. Congratulations, Alex -- I think you deserve the solid Goldzilla. I saw "Godzilla" in May. It was a silly piece of Hollywood fluff. Hey, I didn't go in there expecting "Schindler's List." IMO, a perfect bit of summer popcorn escapism. I like the sound of the IWSG book. Fabulous! Thanks also for the heads up on blog hops etc. I don't think my writing has ever been inspired by songs, though I enjoy so many styles of music. The solid gold Godzilla will go perfectly with my Waterford Crystal Bambi.